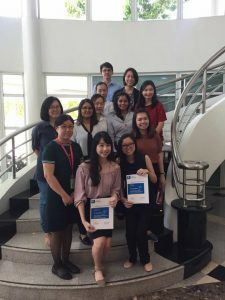 University of Nottingham Malaysia > Blogs > UNM Biomedical Sciences > Awards > BMS made a clean sweep in the 2nd Faculty of Science Postgraduate research showcase! 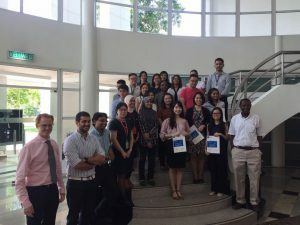 On 20th June 2018, the 2nd Faculty of Science (FOS) postgraduate research showcase was held in the University of Nottingham Malaysia Campus. 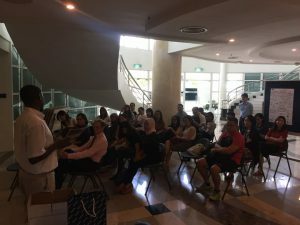 This event was participated by 24 postgraduate students from the School of Pharmacy, Psychology, Biosciences as well as Biomedical Sciences where participants are required to present their research project through a poster presentation. There were 9 postgraduate students from the Department of Biomedical Sciences who took part in this competition. This research showcase serves as a platform for postgraduate students to share their research findings and widen their network to promote any possible interdisciplinary collaboration in the future. Winners of this showcase will be awarded with a decent amount of money to cover the participation fee for conferences in the near future. During the competition, each participant was evaluated by three different assessors in about three hours. Judges from other fields were invited for this event, making the competition more challenging as the participants will need to convey their ‘scientific message’ in a way that is easy to be understood by expert from other fields yet informative enough to deliver the objective of their projects. Personally, I think the ability to engage with public is particularly important as it will be such a waste for a great work to be lowly appreciated due to the lack of skill to convey the real value of our work to the public. Therefore, this is no doubt a good practice for participants to translate their passion into an understandable piece of work to the public. Often, questions asked by judges and public tend to trigger new ideas for participants to further improve their work in future. Many postgraduate and undergraduate students from various schools were found to be interested in this event, therefore visited the event to learn more about the research progress in FOS. The hall was getting more crowded as time passed by, at the same time surrounded by discussion, explanation and occasionally some laughter. Everyone seems to enjoy the event despite the tension built up in participants while waiting for their assessors to come to them. Other than sharing their projects to the public, participants also made use of their free time to stroll through the hall, viewing other posters to learn more about other projects from the respective presenters. This is interesting as there was a flow of knowledge when participants with different background knowledge come together and started to share their work to each other. For instance, students from School of Biosciences are working mostly on plant-based research and some work on cancer studies. Students from School of Psychology works on projects related to eye movement and visual search while students from School of Pharmacy and Biomedical Sciences are more keen on drug discovery, formulation, drug delivery, cancer study, hypertension and discovery of biomarkers for disease. Prof. Nashiru Billa was giving a speech before announcing the winners for the competition. Proudly amazed by the result announced, all the five winners are students from the Department of Biomedical Sciences, making it a real celebration for the department! A group photo of Prof. Andrew Morris, Prof. Nashiru Billa, Dr. Pung Yuh Fen, Dr. Tissa Chandesa and participants taken at the end of the event. A group photo of Prof. Ting Kang Nee, Dr. Pung Yuh Fen, Dr. Then Sue Mian and postgraduate students from the school of Biomedical Sciences who participated in the competition together with the 5 prize winners. As one of the participants of this competition, I was fortunate enough to win the first prize and therefore I would like to express my gratitude to Faculty of Science for organizing the event and giving us this opportunity to win our fund for conferences. Next, I would like to thank my supervisor, Dr. Ho Wan Yong and co-supervisor Dr. Yeap Swee Keong for all the encouragement and guidance provided. Furthermore, I would like to thank Prof. Ting Kang Nee and the Department of Biomedical Sciences for sponsoring us the printing fee for our posters. Lastly, I would like to thank the organizing team for putting all this together, making this educative event a fruitful and successful one.